I hope this is the first of many light-versions of classic New England recipes we develop for our cookbook. Some recipes leave little room for healthy modifications, like the upcoming onslaught of desserts to be posted on promptly given away to friends and co-workers. But when opportunity presents, I plan to take full advantage of calorie-slashing substitutions. Mince the onion, yielding approximately 1 – 2 Tbsp. Combine minced onions and remaining ingredients in a small dish suitable for either serving or storing. Stir together all ingredients until well combined. Serve cold or room temperature with fish entree, such as Cod Fish Cakes. 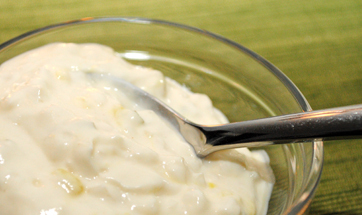 Store extra tartar sauce in the refrigerator for up to 1 week.